“You are my sunshine” is playing. The original version. Meanwhile, as I check my email on Yahoo I see a man clutching his chest in pain having a heart attack. This sort of sums up my mood this morning. A nostalgic optimism plays in the back of my graying mind as I fear the worst. I often wonder if I might just collapse from a heart attack. I heard a story yesterday about a colorful character my coworker had known. The man died suddenly from a heart attack on his way home. The way he told it, it almost sounded sweet, kind of sentimental. He just quietly disappeared. One moment here, next moment gone. But death is not sweet nor sentimental, and heart attacks are horrific. I’ve had one, and hope to never have another, although I suspect that is a vain hope. Advertising and stupid, sentimental stories. That is what I am left with this morning. Grumpy once again. I am usually pretty optimistic, or at least optimistic. Not this morning. The crappy mood from last night has carried over into this morning. Survival. We are so concerned with survival. and yet, we all know that death lies waiting in the wings. I am worried about whether my job will become permanent, I worry about….but I won’t bore you with my worries. I know how much I hate hearing about other people’s worries. It is hard to get excited about anything these days. The election?? Now there is a truly boring subject! I suspect you would rather hear about my worries than read about the stupid election. I think Romney and Ryan will win. Who can resist a little R n’R? Besides, the country is so disappointed in Barack Obama, and tired of the boneheaded way it has governed us. I will vote for him, though, because Romney is so so so much worse!! But I think the obese haters of this country are eager for revenge. They aren’t crazy about Romney, nobody is, but they really want to defeat Obama. All of this just makes me tired and grumpy. The situation overseas doesn’t brighten my spirits either. War is looming on the horizon. Israel and Iran are bound to clash, and we will be obligated to join in. Syria can prove to be the powder keg that ignites such a war, given that Iran and Hezbollah are busy propping up the Assad regime. Too large an Iranian presence in Syria, especially if it starts showing up in Lebanon as well, will provoke an Israel military action to take them out. This, I believe, is more likely than a strike to take out a nuclear reactor. But this is all tedious to think about. In parting, we still need to have a paradigm change, but I am not as charged up about that as I was before. It is enough for me just to get through these days and generate the necessary energy to engage the customers at my job. Probably come Monday, I will find my optimism again and have more cheerful thoughts. I hope so. I am sure I am not alone in my pessimism, but we all need to regain our strength and help to turn this thing around. Because from my vantage point, it doesn’t look good. The whole world looks like that guy clutching his chest and having a heart attack. The more I have sat here and thought about it, I think my original drawing is the best, especially after I used Enhance and Contrast to simply bring out more of the drawing and make it grey, which is what it was originally (for some strange reason, the sketch was made blue during the scanning process). Nothing was added to it however, and in a lot of ways I like that better. Just pure Russell without Gimp may be better. (of course I still used Gimp a little, but didn’t alter anything.) Keeping that quick and dirty sketchbook quality may be the best look for this project. I’ll see what I think….still very much a work in progress. I like all the tiny strokes that typify my quick sketch approach. That was lost when I took it all into Gimp and added filters etc. It will get better. The more I look at this sketch the more I like it, especially since it is my first step in a very long time. This was the last version I did. 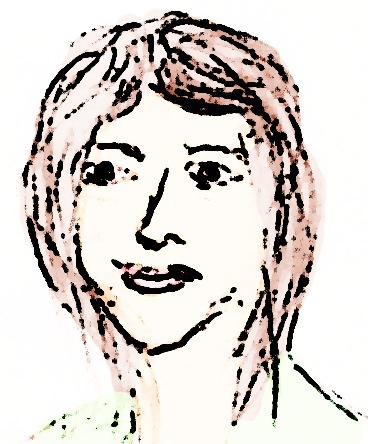 I think I may like it best, because I added a few strokes to give her face more definition, as well as multiple filters to give it a sort of watercolor look. It still looks like a child’s painting, but a ten year old instead of a four year old. It’s a start, and crude as it is, Bernice does have some personality conveyed by this drawing, and that’s the idea, isn’t it? I think I’ll call her Bernice. She is a very precise and earnest woman. Very serious. My jokes go right past her. She practices yoga diligently. This is the beginning of a character in search of a story. I have yet to draw THE character, the one that captures my heart and comes to life magically before me. But I will get there. She is out there somewhere waiting to be drawn. Before judging me too harshly, please consider that this is one of the first drawings I have done with serious intent, in many many years, thirty at least. I need to get my skills back. Tonight I began drawing and it was absolutely horrible!!! I would rather have had my fingernails pulled out one by one than go through the agony of trying to draw and having it look like the efforts of a five year old child. 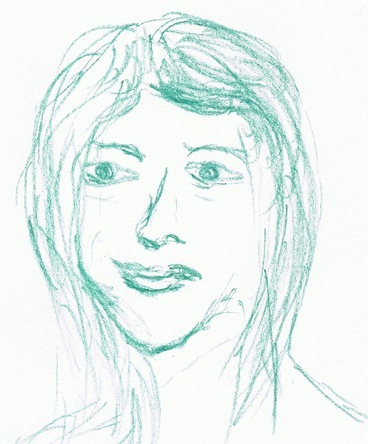 But then I just gave up on it and just scribbled, and lo and behold, the very earnest features of Bernice emerged. She is 43 years old and believes in affirmations. She wrote me this one: “Every day in every way I find myself again. All my pleasures can come to pass in time. Give me patience in my endeavors.” You see? I am already giving Bernice her life in words. Now I need to put together a story. 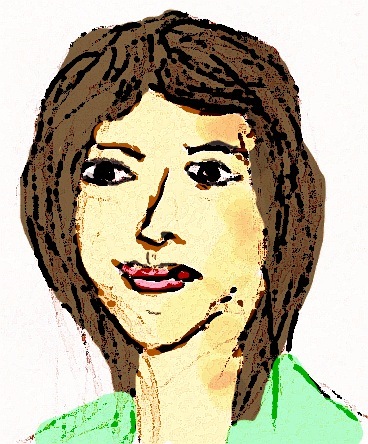 Bernice is a peripheral character, one of the main character’s friends. I may use myself or create someone else. I haven’t decided. But, at least I broke through my resistance to drawing. Considering that I sketched this in about ten minutes (I am so impatient!!!) I am rather happy with it, at least it works to some degree. I like the sloppy quality, I do my best work when I bypass my OCD tendency to want to draw very realistically. This is much more expressionistic, and I captured a very serious and earnest quality in Bernice. She is ‘concerned’. It shows in her face. But I can do better. This is just a start. This is the one drawing I felt I could share without embarrassment. This is so much harder than just using images I find on the net, but it is honest. It is completely my creation, and not a copy of a photograph. But, clearly, I need lots of practice. This whole project will be slow in coming together. I’ve got to put my story together. But, it is interesting how, when I became frustrated and gave up, Bernice appeared, and I already have a sense of who she is. The drawing is just a beginning. I need to bring her more fully to life. I can’t wait to do more!! !, even though it is very hard work. It is hard to describe how I work, I just start scribbling and something begins to emerge. I can’t plan it, or I drive myself crazy. The more I draw, though, the better I will be. My fledgling attempts to write, back when I began my first blog, were equally amateurish. I will get better. I will get a lot better, if I just keep on drawing. So here are some examples of what I did on Gimp (poor man’s Photoshop) after I scanned my drawing. I got some interesting results. I hope you enjoy, and perhaps my first baby steps in drawing will inspire other bloggers to illustrate their work as well. This is the original drawing, done freehand on a pad, old school. I knocked it out in about ten minutes, tired and frustrated after an hour of absolutely horrible drawings. This isn’t a good drawing but it is a start. On some level it seems to work. Bernice is born. Hi Bernice!! I used Gimp to add washes of color. This is really childlike, but it has it’s charm. 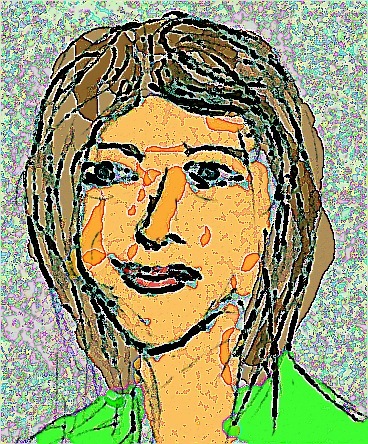 I used Enhance to create this very expressionistic version. I like it and I don’t. Just experimenting. I love just messing with the possibilities. 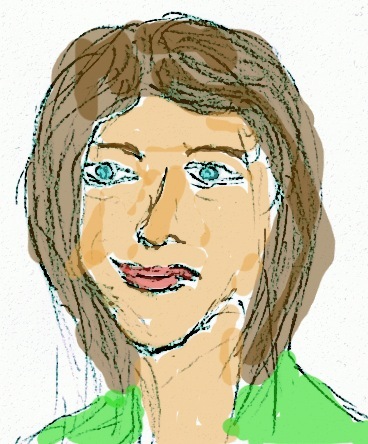 The Oilify feature gives my drawing the look of a watercolor. I sort of like it, but as I post these versions of Bernice I find that I actually like the original drawing the best in a lot of ways, because it looks fresh and spontaneous, because, guess what? it was. So I learned a lot in a short time. I was surprised at how adept I was in the retouching to the drawing depicted in the final version of Bernice. In just a few seconds I instinctively knew what to do. It is still a poor drawing, but slowly but surely I am getting back in the game, and regaining a long lost talent. As I do more of it, my true abilities will reappear. But what a struggle! but I promise I won’t cut off my ear and send it to ‘you know who’. In this beginning of the beginning of a new series yet to be named or plotted out, I am proud to say I am indebted only to myself and Gimp. There were no outside sources. It is very fitting that this is the 300th post on this blog. It is a positive culmination of my creative surge over this past year.